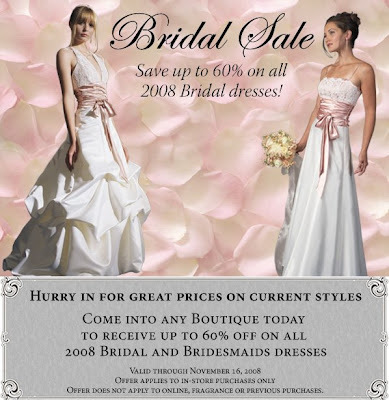 Jessica McClintock boutiques are offering up to 60% off on all of their bridal and bridesmaids dresses! The sale is valid through this upcoming Sunday, November 16th. Unfortunately, this does not apply to any of us who live in Arizona. The discount is only valid on in-store purchases at their boutiques. Hopefully some of you lovely readers who live outside of the state will be able to take advantage of this awesome sale! Click here for boutique listing.